How to make Andhra style Aavakaaya raw Mango Pickle at home? Avakaya / Aavakaaya / is mango pickle made by the Andhra people in South India. Aavakaaya pickle has an important role in Andhra people’s culture. Infact Andhra culture may be thought to be incomplete without aavakaaya. The name avakkaya is derived from ava meaning mustard (kaduku) and kaya meaning mango – Thanks to our subscriber Rekha Pyaraka for this info. Andhra people prefer to prepare avakaya / gongura with plucked uniform sized mangoes. The mangoes should just start maturing so that it should be possible to cut there inner core. After selecting the mangoes, they should be washed thoroughly to remove the dried sticky liquids on their surface. Wash each mangoes seperately by rubbing with your hands. After that with a clean and dry cotton cloth pat dry each manoges. After drying the mangoes, chop them into 1inch size pieces. You need to have really sharp hard knife for this. The inner shell of the mangoes should remain intact (to improve the shelf life of pickle). Using an ordinary knife remove the seeds and peel of the white membrane attached to the hard inner shell. Weigh the ingredients using the same cup and keep ready the sterilized jar for storing the pickle. Roast the mustard seeds (switch of the flame before they starts crackling) and then grind it into fine powder in a mixer – Keep it aside. Divide the garlic into two halves and mash the one half – Keep it aside. In a bowl, add the mustard powder, salt, red chilly powder, mashed garlic and fenugreek powder together and mix well – This is the masala needed for Avakaya pickle. Take a handful of mango, and put in another bowl. Add oil and a spoon of avakaya masala to this. Mix it thoroguhly with your hand and transfer it to the sterilized jar. Add a part of the remaining garlic pods to the jar as layering over the mangoes. Repeat process #4 and #5 with the remaining mango pieces. Add 1/4th cup of oil over top of the mangoes in the jar and cover it with the lid. The oil should float alteast upto 1/2inch. Keep it for three days. Mix it in between on Day 2 using a clean, dry spoon. On day 3, mix it again and taste it. Add extra oil or salt only if you feel it is low. Serve with rice, curd or ghee. It is recommended to us mangoes which are sour in taste. For some people the pickle may seems too hot, especially with the garlic. In such case reduce the quantity of garlic. The spicy variant of aavakaaya, we just prepared is also known as Allam Aavakaaya. Try our other mango recipes too. How to make Kerala style Ripe Mango Curry? 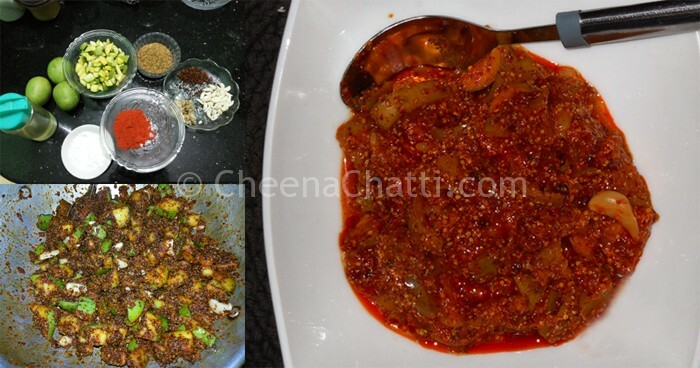 How to make spicy Mango pickle / Kerala Manga Achar easily at home? How to prepare sweet and tasty Mango Burfi at home? This entry was added on May 6th, 2014 by Renoos in Condiments and tagged with easy pickle recipe, how to make andhra mango pickle, avakkai mango pickle, south indian mango pickle recipe, avakaya recipe, how to make mango pickle andhra style, pickles, mango pickle recipe, different types of mango pickles. Last revised on March 27th, 2018. Hi Renoos FYI gongura is something totally different stuff..a leafy vegetable used in cooking and pickling for its tangy taste. Nothing to do with avakkaya… the name avakkaya is derived from ava meaning mustard (kaduku) and kaya meaning mango…. @Vidya: I couldn’t find any reference to ginger in this post. May be you got confused for gingelly oil (Sesame oil). Please let me know if I am overlooking something here.